Freshly made Italian Sausage is the second best sausage choice next to Ukrainian Pork sausage (Kovbasa), at least on my list of favorite sausages. I love shopping at the Dutch Country Farmers Market, in Middletown Delaware, for fresh meat products made daily by local farmers, as well as locally grown fruits, vegetables, freshly baked goods and homemade Amish foods. 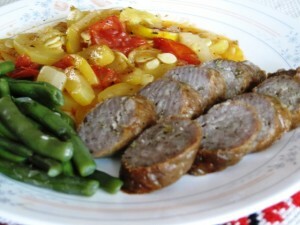 This week I purchased fresh Sweet Italian Sausage, Sage Sausage, and Fresh Polish Kielbasa (Sausage). The Nuwave oven came in handy for preparing the Sweet Italian Sausage for a quick dinner tonight. I served the sausage with, vegetables from my garden; steamed green beans, and summer yellow squash sautéed with Italian spices, olive oil, onions, garlic, and tomatoes, previously prepared in my Nuwave oven. Cut each sausage link into 3 equal section. Flatten slightly, or easier handling and cooking. Place the Nuwave oven rack on the 4 inch height. Place the sausages on the rack (as close to the middle as possible). Place the side cylinder over the base, fasten the lid in place, per manufacturer directions. Press the Power button once (this sets it on High). Set cooking time to 12 minutes and start cooking. After 12 minutes, carefully remove the dome of the Nuwave oven, and set aside. Using kitchen tongs, turn over each sausage. I also moved the sausages from the middle toward the side, and the side ones to the middle, for even cooking. Place the oven dome over the food. Press the Power button once again, and set cooking time for another 12 minutes. Once done, let sausage rest for 2 minutes, before removing oven dome. Serve as links, or slices, as I did in the above picture.